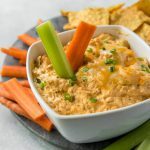 This Keto Buffalo Chicken Dip makes for a delicious, keto-friendly appetizer and snack that can be served with vegetables or low-carb crackers. Its super easy to throw together, especially if you already have some shredded chicken on hand. Bake in the preheated oven until hot and bubbly, about 20 minutes.